The author’s premise is that school evaluation and improvement programs have become increasingly preoccupied with a narrow set of measures that, while satisfying the desire of some for ‘hard’ data, are increasingly ignoring many critically important aspects of every school’s responsibilities and achievements. In this paper he argues that this trend is undesirable and unnecessary. He argues for a more broad-based, comprehensive approach that focuses comparisons not between schools, but against international: research, literature and leading practice. 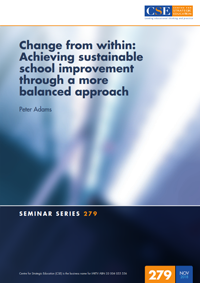 He argues for a return to a balanced approach to measuring school performance and in planning for improvement.